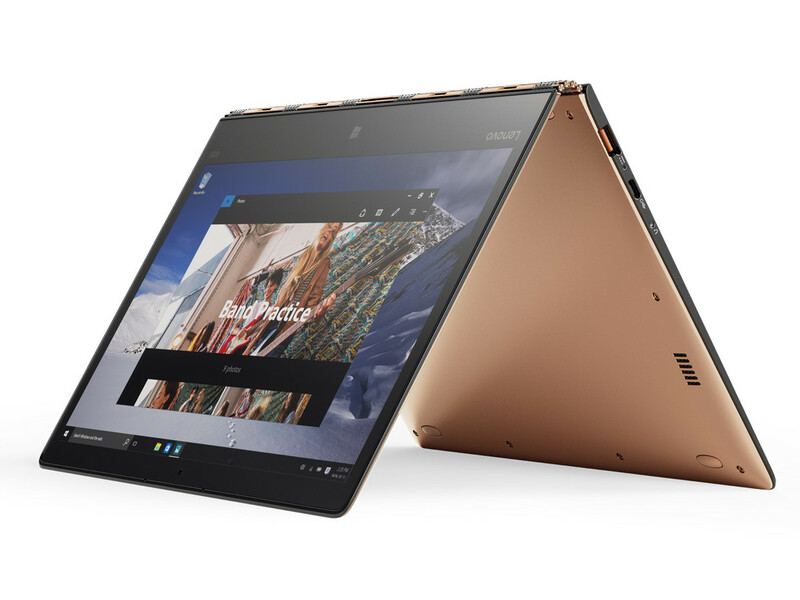 Lenovo has been polishing its Yoga lineup since its first debut in 2012 and combining all of its craftsmanship into the, what claims to be world’s thinnest and lightest convertible. Well, that applies mostly to the high-end members of the series. With a bit of jumping back and forth in a love-hate relationship with Intel’s Core m, Lenovo brings back the mobile chip into its flagship Yoga. 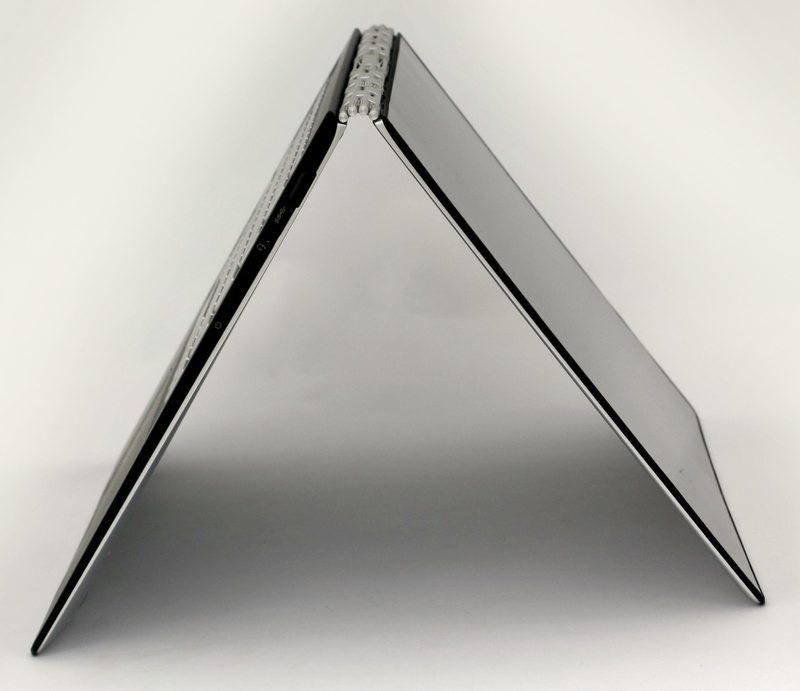 The Yoga 3 Pro, for example, was a bit of a letdown mainly due to the unsuccessful first launch of the Core m chips. Last year’s Yoga 900 brought all the glory with the Core i processors and now we have this beautiful mix between the last two generations with some significant improvements over the Yoga 900. That is, however, mostly because of the Core m CPU allowing the machine to shrink in size. Basically, the Yoga 900S is a more refined, smaller and lighter version of last year’s Yoga 900 coming with a smaller screen size – 12.5″ while the Yoga 900 was 13.3″. The Yoga 900S is expected to be launched during May with a starting price of $1 099, successfully challenging the new Dell XPS 13 and Toshiba Satellite Radius 12, although both machines have much faster Core i7-6500U processors. So without further ado, let’s see if lighter and thinner is really much better. Since we are using an engineering sample, we can’t be sure what will the final unit ship with. As we already said, the Yoga 900S is just a bit lighter, smaller but keeps the overall design signature from its bigger sibling. 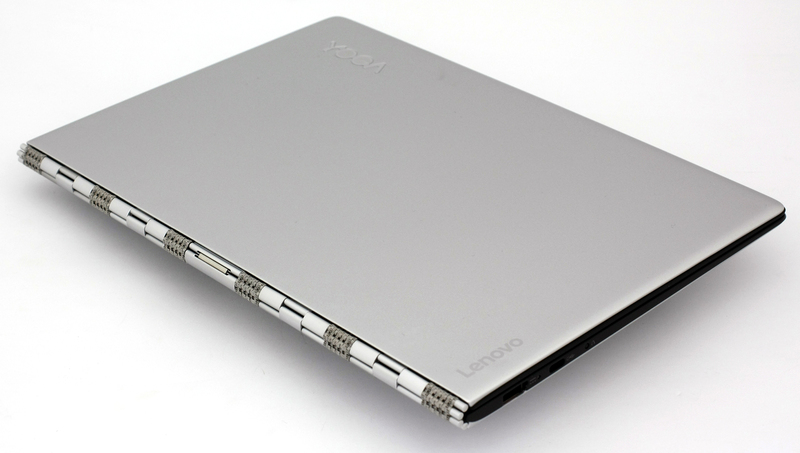 But in order to keep the weight low, the engineers from Lenovo were probably forced to used mostly plastic in the build as the lid and bottom plate are made of plastic that successfully mimics anodized aluminum. Even when touching the surface feels metal-like, yet we are pretty certain that this isn’t the real deal. It’s possible, however, that the final units will be replacing the plastic build carbon fiber construction as Lenovo has stated during its launch at CES 2016. We will know for sure in May, though. Let’s start with the lid as we always do. It’s made of plastic, as we said earlier, but it really fooled us at first glance. 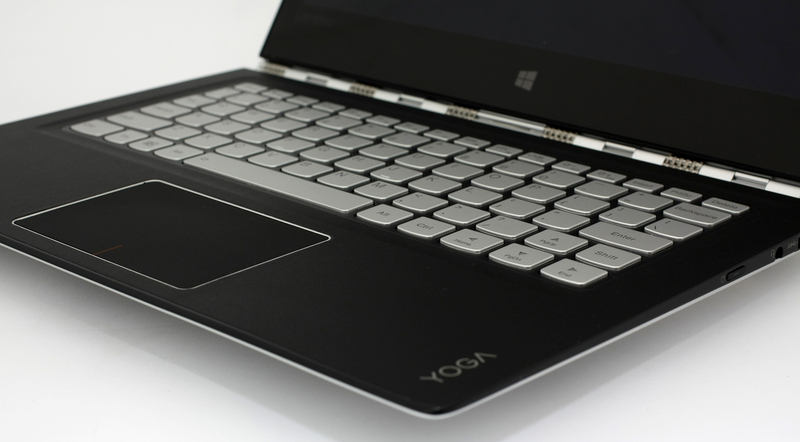 It’s clean and polished with only the Yoga logo sticking out in the top-left corner. Bigger pressure makes the lid give in, but not as much. Either way, we are pretty surprised by the sturdiness provided by the carbon fiber-plastic blend here. 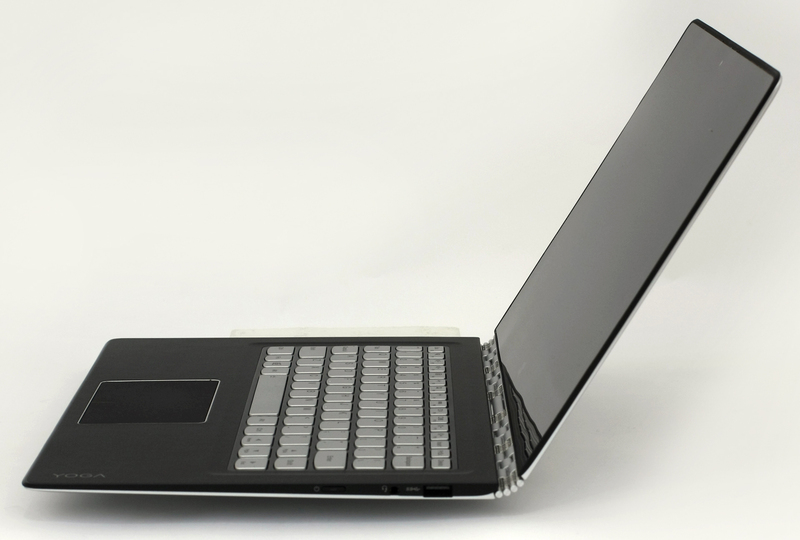 Opening the laptop is rather difficult as the hinge is tightly pulled and you will need both hands at all times. The iconic watchband hinge provides smooth and stable movement throughout the whole 360-degree rotation, yet the annoying wobbling effect while using the touchscreen in laptop mode is still present. Well, slightly reduced compared to other ultrabooks on the market, but still as prominent. Also, the edges of the lid are wrapped in this thin silicone strip so it will make the device more stable in tent mode. And finally, the bottom side has just those two grills on the sides – for the loudspeakers of course. 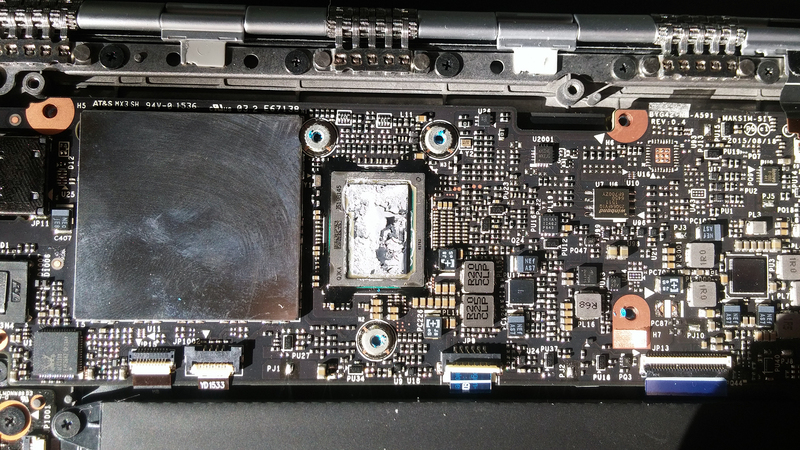 Other vent openings are missing since the ultrabook is using a passive cooling system with the Core m processor. The sides are freakishly thin and we suspect some of the ports are left out because it would have ruined the ergonomics here. We’ve got only a tad thicker than 12 mm height at the thickest point with the left side accommodating a USB 3.1 Type-C connector and a small button for a hardware reset if needed (or in other words – battery reset). And here’s where the tricky part comes. The left side also has the DC charging port, which is a combination between a normal full-sized USB port and the actual DC charging slot. You cannot use both at the same time, though, so you will have to rely on the other USB 3.0 port on the right side, which is paired with the 3.5 mm combo audio jack and the power button. Interestingly, the interior presents a totally different approach using some kind of delicate leather-like finish. It definitely feels great and it doesn’t attract fingerprints. 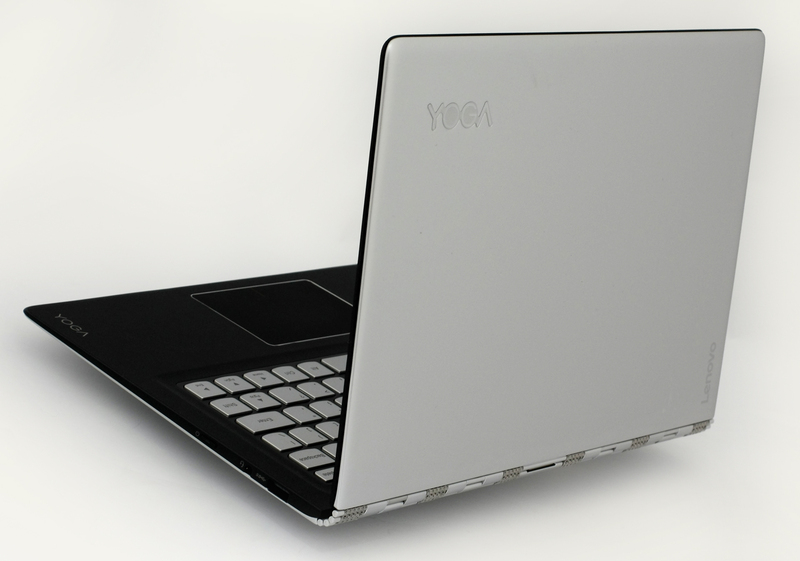 It’s also fairly easy to clean and looks like the one we found on the Lenovo Y900 but more silky smooth. The wrist rest area of the Lenovo Y900 was a bit rough and suits the need for long hours of gaming while the Yoga 900S will surely appeal more to the business users. Moreover, it feels stable and doesn’t give in too much under pressure. 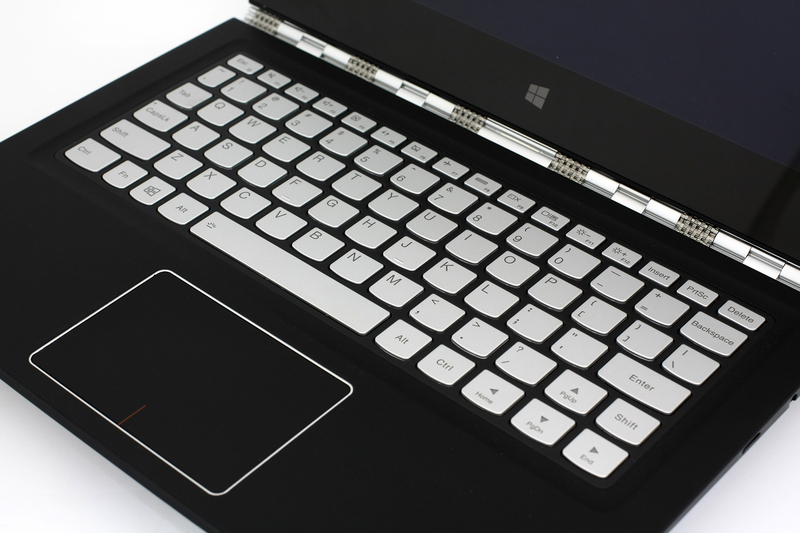 As for the keyboard, it’s a variation of the usual AccuType keyboard on most Lenovo notebooks, but it doesn’t provide the same comfort while typing. Except for the main keys, the secondary ones are pretty small (like the Windows button, Fn key and the Alt). Although, this is pretty acceptable given the size (12.5-inch display) of this machine, but we cannot get past the shallow buttons. The key travel is a bit too short and sometimes we were wondering if we were really pressing keys. The touchpad, on the other hand, feels reasonably sized, for a 12-inch ultrabook that is, it feels a bit “wobbly” at times but nothing that will get in the way. Swipes, gestures, and clicks are registered accordingly and fairly accurately. Our final thought on the machine in terms of design and build quality is that the Yoga 900S’ main selling point is the excellent craftsmanship, which Lenovo has demonstrated. The iconic watchband hinge provides fairly good stability with little wobbling while using the screen, the casing feels tight and well-built and the choice of materials isn’t all that bad at all, despite the fact that most of it is polycarbonate. That’s true, however, for the outer chassis but the base is believed to be built using carbon fiber. The interior boasts silky smooth leather-like finish and the touchpad is really good. 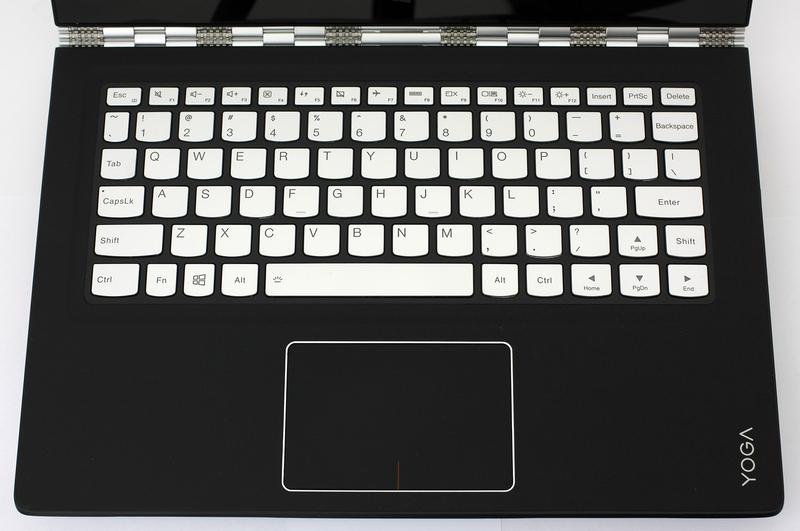 However, the keyboard is a bit too shallow and some of the keys are too small even for a 12-inch machine. The whole keyboard could have been extended a bit further to the edges to make the most of the unused space. Anyway, if you are looking for a notebook on-the-go with exceptional build quality and ridiculously (we mean that in a good way) low weight (999 g) and height (12.7 mm), the Lenovo Yoga 900S should on top of your list when searching for a premium 2-in-1 device. As we stated in our disassembly article, the notebook is fairly easy to teardown and reach most of the hardware inside. 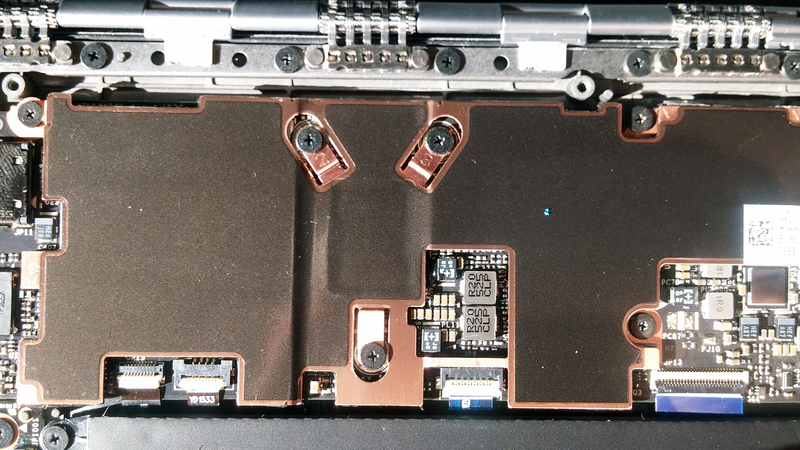 You just need to remove the screws that hold the bottom plate and get on with your upgrade or “spring cleaning”. Before you proceed, though, we suggest disconnecting the battery first. After all the screws have been removed, proceed with prying up the plate, which, by the way, is made entirely out of plastic, but we are sure this will change until May’s official launch. The finish on the bottom sure feels like aluminum but it’s not the real deal. 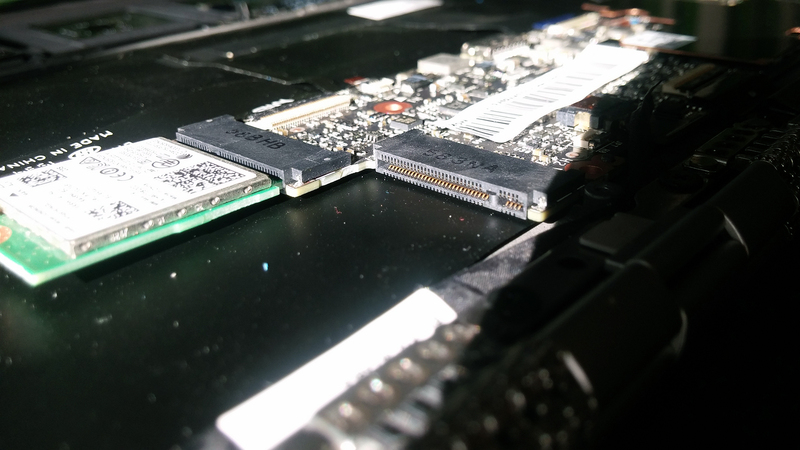 Since space is pretty scarce in this machine and the hardware is crammed inside, the notebook uses only one M.2 SSD slot and that’s understandable. 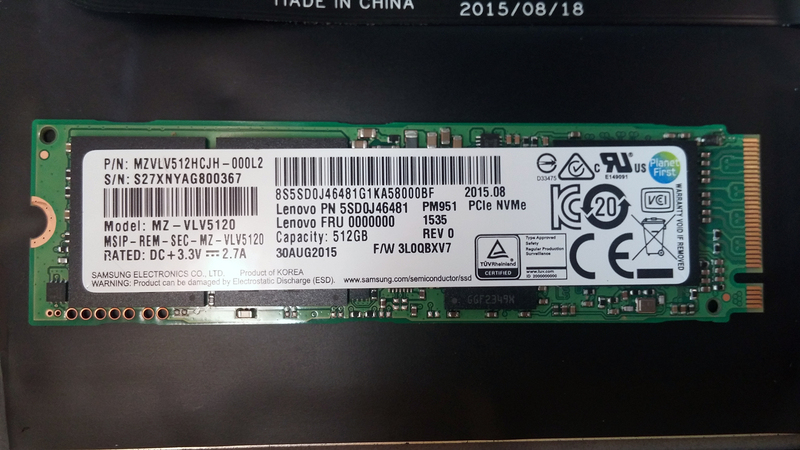 But hold your horses because the ultrabook surprised us with the next-gen NVMe support and the M.2 stick we found inside was Samsung-made with 512GB capacity, 2280 standard with M-edge key connector. 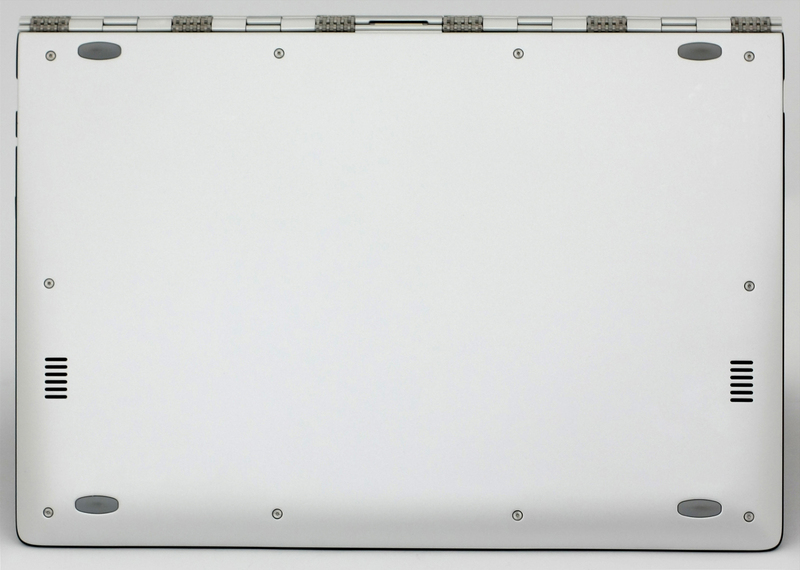 The slot also uses M-edge key connector, but you can easily fit B&M-edge key M.2 SSD stick as well. 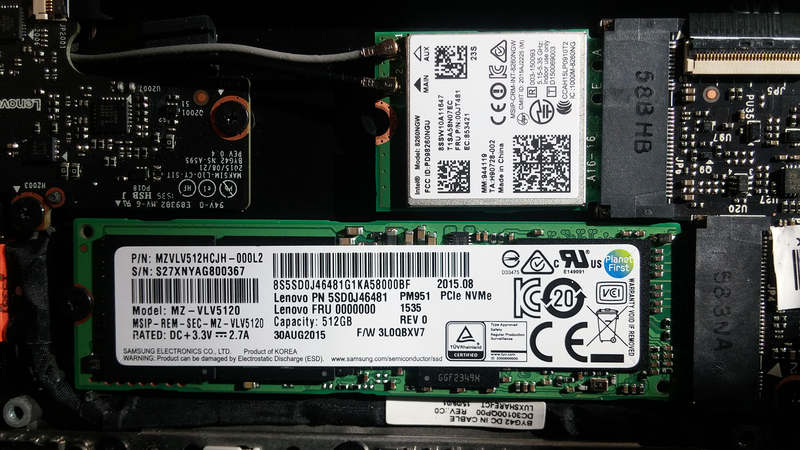 We also found Intel Dual Band Wireless-AC 8260 module right next to the M.2 SSD stick supporting 2×2 Wi-Fi 802.11ac and Bluetooth 4.1 connectivity. During the teardown, we also found out that the RAM chips are soldered to the motherboard and no upgrade is possible. Finally, the battery we found inside is taking most of the space, since the notebook is quite thin and it stretches across almost the whole casing, but still boasts a big 52Wh capacity. We are expecting some pretty good results on our battery tests. 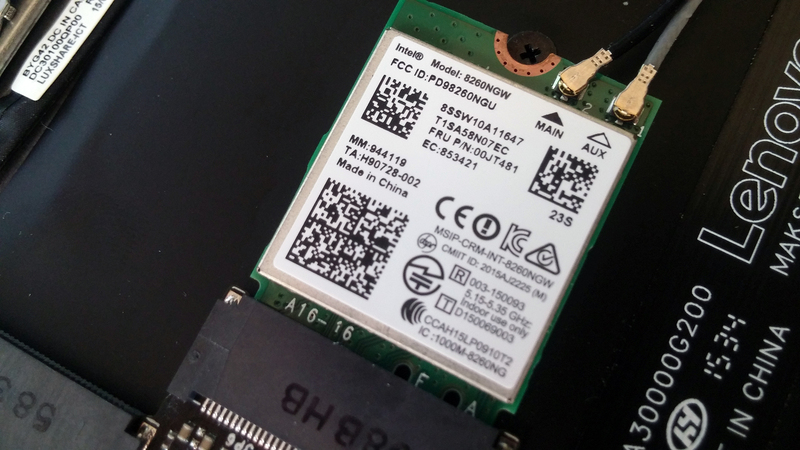 The notebook uses a mobile Core m5 chip with really low voltage – 4.5W is the standard TDP but can go up to 7.5W if the manufacturer allows it – so the SoC doesn’t need big cooling system but only a passive one with just a heat sink to support it. 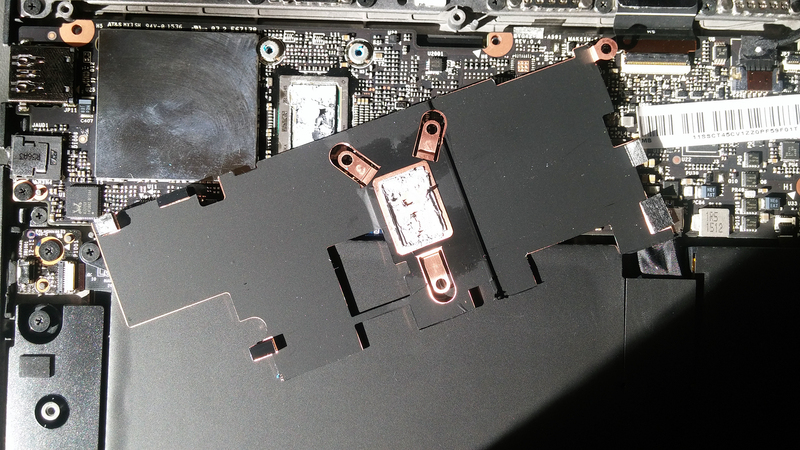 You can see on the photos below how to remove it and change the thermal paste. 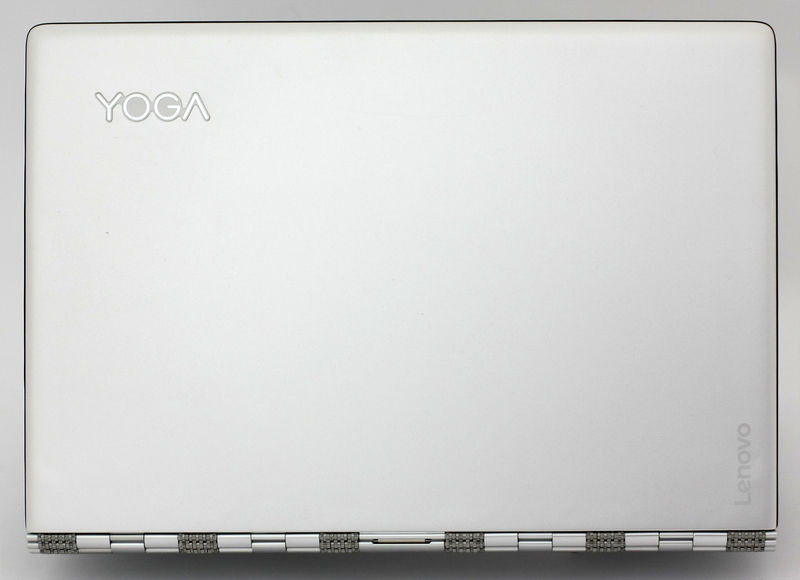 The Yoga 900S we got as an early testing sample was the version featuring the Full HD IPS panel with model number B125HAN02-2 manufactured by AU Optronics. It has a diagonal of 12.5 inches and resolution of 1920 x 1080 pixels leading to a pixel density of 176 ppi and 0.144 x 0.144 pixel pitch. It can be considered as “Retina” if viewed from a distance equal or greater than 51 cm. The maximum brightness we were able to measure was around 283 cd/m2, which is pretty low for its class and might obstruct normal usage outdoors or near strong light source. The maximum deviation, however, is just 10% and the color temperature is 6630K, which is quite close to the optimal 6500K (D65). You can see color temperature of the gray color at 150 cd/m2 (80% brightness). We used the default profile on the left and the right represents the “Paper display” mode. This is an interesting feature that automatically adjusts the color temperature of the display depending on the surrounding conditions. The end goal is to provide comfortable reading experience with the use of the webcam. Lenovo Yoga 900S’ display covers just 55% of the sRGB gamut leading to not enough saturated images. However, the contrast ratio is excellent – 1190:1. You can see the color circles below representing each color with 25%, 50%, 75% and 100% saturation while the white circles stand for the actual results. The profile we created uses 150 cd/m2 brightness and 6500K (D65) color temperature. It seems that the color accuracy is quite high out of the box. Below you can see the results from the accuracy color checker with 24 commonly used colors like light and dark human skin, blue sky, green grass, orange etc. We illustrate the color accuracy before and after calibration. The screen doesn’t use PWM for adjusting brightness, or at least not in our usual understanding of the PWM. The backlight doesn’t turn off the lights completely and the emitted light is at really high frequency – 67 kHz. It can easily be considered as user-friendly. We have mixed feelings about the display because it offers good image quality to some extent but fails to meet our expectations of a high-end ultrabook. The sRGB color gamut coverage is pretty low (55%) for vivid images and the maximum brightness is insufficient for normal usage outdoors, which might be often considering the form factor of the device, but the contrast ratio and viewing angles are excellent. Most importantly, the display doesn’t use PWM for adjusting screen brightness and can be considered as user-friendly. 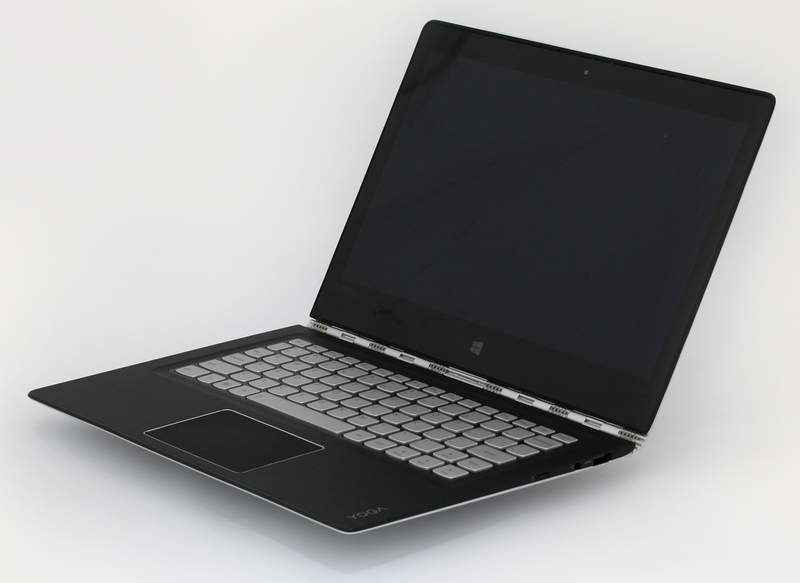 The laptop is able to reproduce a good sound quality for general multimedia, but, of course, the lows are not as good. We were quite impressed by the size of the battery Lenovo had managed to stick inside. The capacity is the whopping 52Wh and takes most of the chassis inside and that’s quite impressive given the weight of only 999 g and the 12.7 mm thickness. And just as expected, the ultrabook delivered some impressive battery runtimes regarding video playback and web browsing. Keep in mind that this is an early engineering sample so the battery life might be slightly improved with the retail version, but will probably fall on the variant with QHD (2560×1440) display. All tests were performed using the same conditions as always – Wi-Fi turned on, power saver turned on and screen brightness set to 120 cd/m2. Oustanding runtime – 461 minutes (7 hours and 41 minutes). Slightly lower, but still excellent result – 375 minutes (6 hours and 15 minute). As expected, the gaming test took a toll on the battery with only 85 minutes (1 hour and 25 minutes) of play time. The Core m5-6Y54 CPU is part of the Skylake generation processors and it’s part of the very power efficient SoCs from the m lineup. Due to its extremely low TDP, which can be adjusted from 3.5W up to 7W, but normally being 4.5W, the SoC can be integrated into passively cooled 2-in-1 devices, ultrabooks or tablets. The processor incorporates two cores supporting the crucial Hyper-Threading technology ticking at 1.1 GHz and can go up to 2.7 GHz for one active core and 2.7 GHz for two active cores. It’s manufactured using the latest 14nm FinFET process. Normally the CPU can reach the core i5-6200U CPU in some short synthetic benchmark tests, but since the CPU is heavily temperature dependent, during prolonged usage the SoC won’t be able to keep up. So its performance relies quite a lot on the passive cooling system of the device. The SoC also integrates Intel’s HD Graphics 515 GPU, codenamed GT2, with 24 EUs (Execution Units) clocked at 300 MHz and can go up to 900 MHz. Anyway, the whole SoC, including the GPU and memory controller (dual-channel LPDDR3-1866/DDR3L-1600), is rated at 4.5W TDP but it can be lowered down to 3.5W or raised as much as 7W but that’s up to the OEM that builds the machine. Normally, the Intel HD Graphics 515 can be found on the latest Core m Skylake SoCs but it’s considered as a low-end iGPU. It represents the GT2 variants of the Skylake iGPUs and features 24 of the so-called EUs (Execution Units). They are clocked at 300 MHz and can go up to 1000 MHz but that depends on the CPU model. Intel claims about 40% better performance than the last HD Graphics 5300 (Broadwell) generation GPUs, but that is strongly dependent on the CPU model and the TDP so statistics may vary. However, there are some notable features that come along with the HD Graphics 515 like H.265/HEVC fully hardware decoded and supports outputs like DP 1.2 / eDP 1.3 and HDMI 1.4a. The GPU can handle up to three displays connected simultaneously. The power consumption of the whole SoC may vary, but most of the time it’s 4.5W. Nevertheless, it can go down to 3.5W or go up to 7W. These numbers include the CPU, iGPU and the memory controller. This sort of test cannot be considered as a good representative of a real-life situation, especially for a machine like the Yoga 900S. However, it’s a good way to assess the overall stability of the system in the long run. Since the laptop features a mobile Core m CPU, the performance of the SoC will go down really fast because it’s not designed to withstand continuous heavy usage. And it’s also using a passive cooling system. We start off with 100% CPU load for an hour and unsurprisingly, the CPU’s Turbo Boost frequency (2.4 GHz for two active cores) was quite short and fell down to 1.2-1.5 GHz in order to maintain normal operating temperatures. Still, no throttling occurred since the base frequency of the chip is 1.1 GHz and that’s a really good thing when you keep in mind that the SoC is integrated with a passive cooling system (no fans). You can see the temperatures below – 46 °C at normal state/usage, which is a bit high, but we want to note again that the silicon runs at higher temperatures when there’s no steady airflow and between 63 °C and 89 °C depending on the current frequency. The green line below represents the CPU load while the red one stands for the CPU temperatures. After an hour had passed, we turned on the GPU stress test as well. 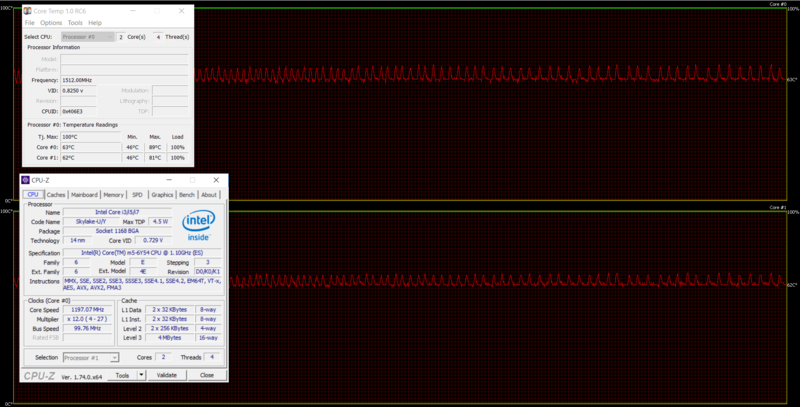 To make some room for the iGPU, the CPU started throttling and ticking at around 500-800 MHz. 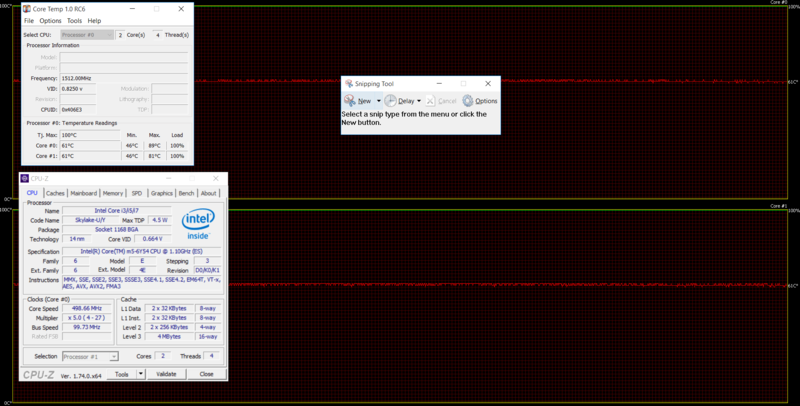 The CPU’s temperatures remained at around 61 °C stable and there were no unexpected “occurrences” during the whole test. You can see on the temperature map below that the temperatures were a bit high, but that’s after 2-hour long heavy usage (100% CPU + 100% GPU load), so it’s quite unlikely that you will reach such temperatures. Spec-wise, the notebook packs an Intel Core m processor, which is Core m5 in our testing unit, which would prove useful for your daily driver regarding simple tasks like browsing, document editing, multimedia and even more graphically or CPU demanding tasks due to high Turbo Boost frequencies and the excellent utilization of the latter by the notebook’s system. You will also find useful the blazingly fast file transfer and system loading thanks to the support of next generation M.2 PCIe NVMe SSDs. Speaking of file transfer, we are a bit disappointed by the fact that the notebook offers only one usable full-sized USB port when plugged, although, you can always pop in an USB-C hub if you need the extra peripherals. And besides, the battery life is so good that you won’t need to hug the wall all the time as the battery runtimes show that you can get through nearly a full workday with normal usage. We also suspect that battery life might be even better in the final units as this is a pre-production sample. And last, but not least, the display quality is somehow underwhelming. If you are aiming for the QHD model, it might be the safer bet, although battery life will fall considerably. So back to the display at hand. It has fairly low display brightness, which might obstruct normal usage outdoors, pretty low sRGB coverage (55%) but it does deliver good contrast ratio (1190:1). So it might not be the best solution for multimedia but it will do the job just fine for your daily activities. Still, we are a bit disappointed by the image quality with the asking starting price of $1 099.